Arimar is a primary manufacturer of safety equipment and, few years ago, it applied the technology and technical expertise used in the project and production of self-inflating life rafts to produce inflatables. Nowadays, the range includes, among other models, the Pioneer series: elegant and reliable inflatables with GRP hull. The Pioneer series spans from the 400 to the 540, which we tested at sea. The Pioneer 540 is extremely maneuverable, very fast and, like all Pioneer inflatables, is in DTEX 2200 the strongest material for leisure inflatables. The tubes are designed and built with the so-called "organ-pipe" compartments. We liked some of the boat's rational solutions: the anchor locker may be opened without removing the forward sunning cushions which are attached to the flooring. Inside the forward locker of the cushioned area there is a special fitting for the life buoy; in the same way, the folded swimming ladder is fitted under the pilot and co-pilot settee. The cushions may be moved forward or aft over this settee for different applications. The swimming ladder may be unfolded and fixed to one of the two base supports of the roll bar, on one side of the inflatable, in order to avoid dangerous contact of the swimmers' feet with the engine leg and/or propeller. We tested the Arimar Pioneer 540 with the maximum power for registration and testing reasons, but the ideal power is approx. 70 hp (maximum speed of 37/38 knots and cruising speed of 30 knots with a fuel consumption of approx. 6 gall/hr). If you are looking for an excellent price/consumption ratio with maximum performance, the Pioneer 540 offers dry rides, excellent trim, perfect maneuverability with a 40 hp outboard engine (maximum speed of 27 knots and fuel consumption at cruising speed of approx. 3 gall/hr! Total engine weight: 115 lbs. 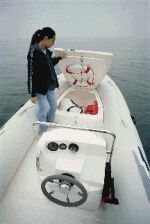 Standard fittings of LX version: full helm station with steering wheel, single-wire transmission, stainless steel grabrails, two lockers, settee for two passengers, sunning cushioning, swimming ladder, roll bar, inflatable cover, pilot settee with cushions. Deck materials and characteristics: notwithstanding the average size, the boat is comfortable and safe.